Peace Lodge introduces its guests to a symphony of purely Costa Rican experiences celebrating the natural wonders of the rain forest and the splendid creatures that inhabit this magical environment. 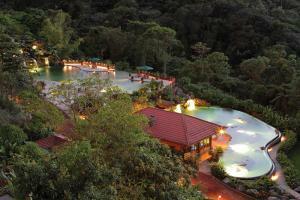 The upscale accommodations are uniquely themed to complement the inherent beauty of its rain and cloud forest setting. Located less than one hour from the San José (Juan Santamaria) Airport.